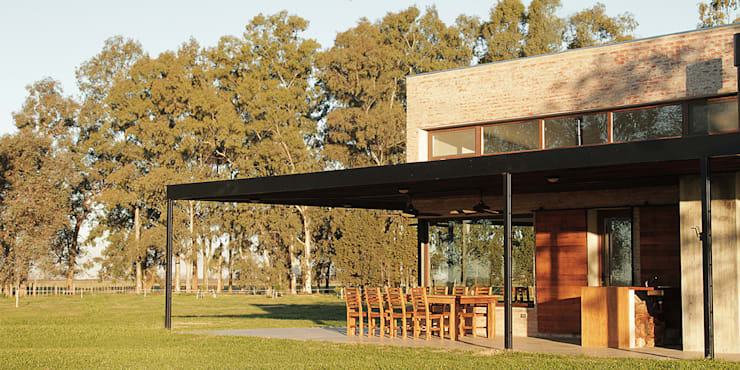 When rustic and contemporary meet, the visual impact is simply breathtaking. And that is exactly what we found when we visited Casa CL in San Isidro, Peru. 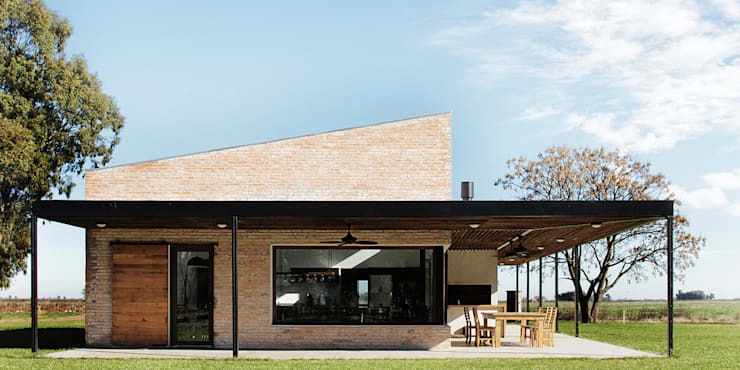 The abstract cuts and angles of this home ensure that there is plenty of modernity at play. But the property also flaunts its earthy charm unabashedly, thanks to the rustic touches incorporated into the basic design of the home. Soothing and earthy hues, simple yet elegant accents, modern fixtures, and ample scope for inviting sunlight inside are features to look out for. Credit for this marvellous abode goes to the architects at Bam! Arquitectura. 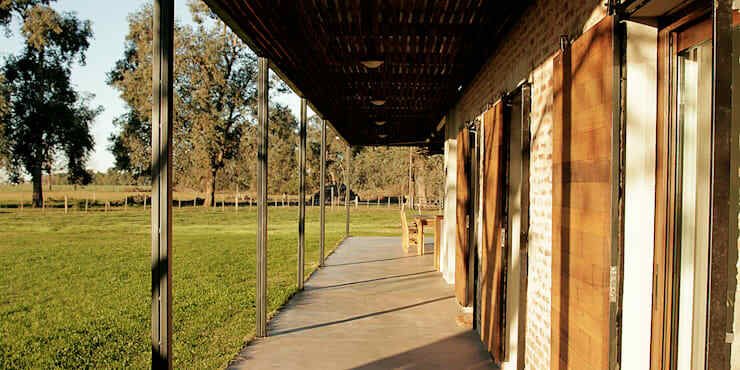 The home is set on an expansive green acreage, which forms a perfect backdrop for the stone and tiled facade with its rustic patio. The glass windows wrap the corners, while the roof juts out at an interesting angle. The side view of the home reveals the glass windows that deck the wall above the patio shade, while wooden doors line the facade in a row. Traditional wooden doors and brick-lined walls ensure that the rustic touch is a tangible part of the contemporary structure. The high ceilings of the expansive patio make for some interesting angles, while a comfortable and sunny sit-out is created with the solid wooden furniture. 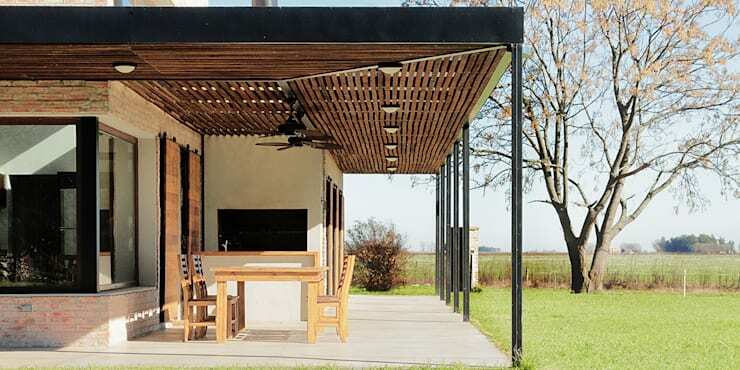 Slim wooden slats make for a sleek, natural look when applied to the ceiling of the patio shade. The interiors feel airy and sunny, thanks to the large glass windows and white walls. The simple but elegant dining arrangement is perfect for the whole family to enjoy yummy meals together. 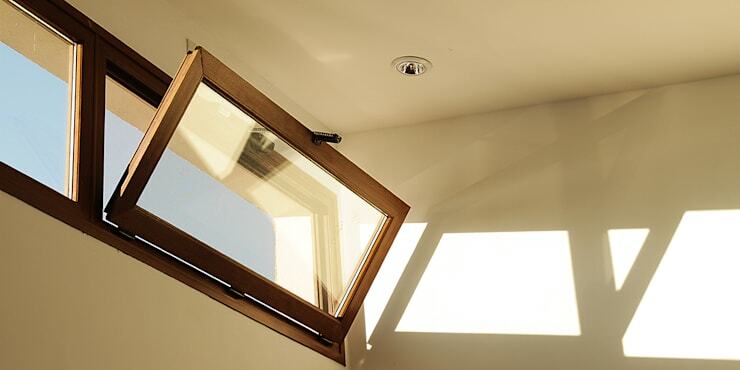 The home has an array of windows that open near the ceiling, allowing the adequate influx of light and air. 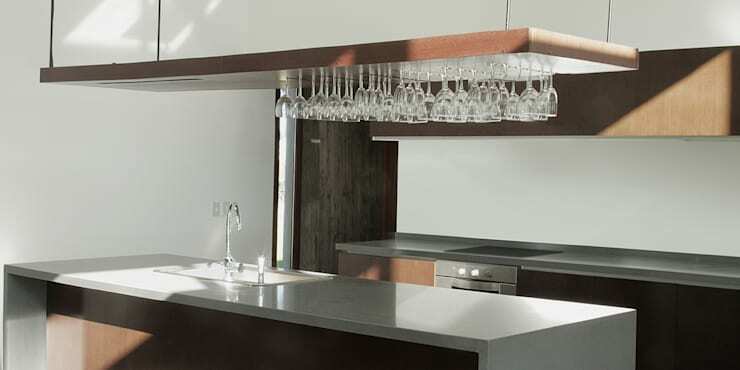 The kitchen is filled with modern delights that have a rustic edge, like the sleek stone-finished countertops, and the wooden contraption for hanging glasses. 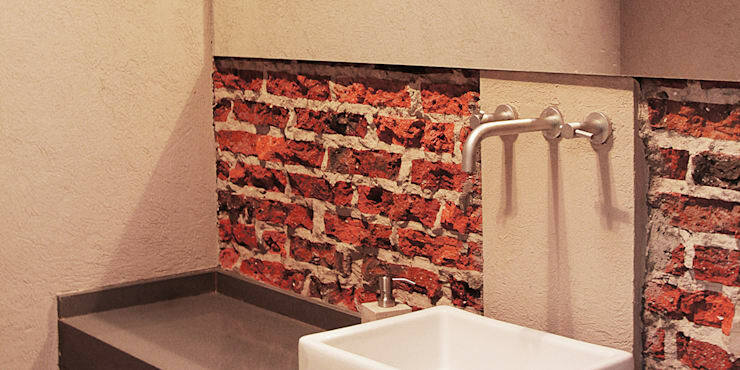 The raw brick backsplash is a slim and earthy addition, perfectly balancing the modern fittings used in the bathroom. The chrome good looks are well-balanced by the vibrant brick hue. 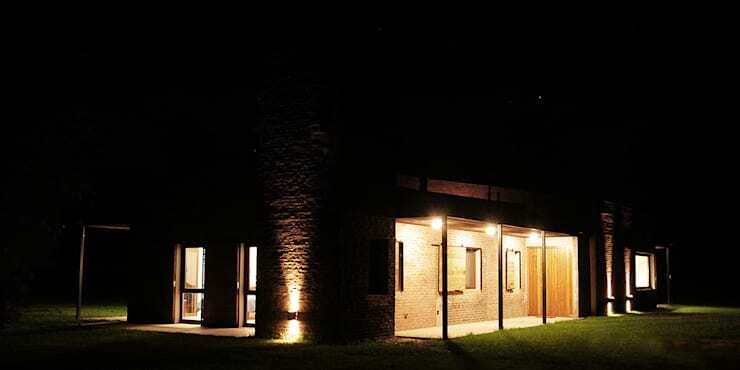 The subtle lighting both inside and outside the house ensures that the brick and wooden finishes stand out elegantly after dark. 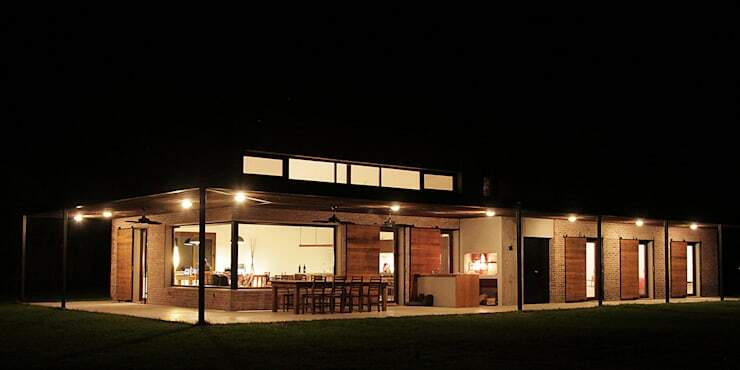 The simple and linear charm of the home is also perfectly accentuated, thanks to the lighting. 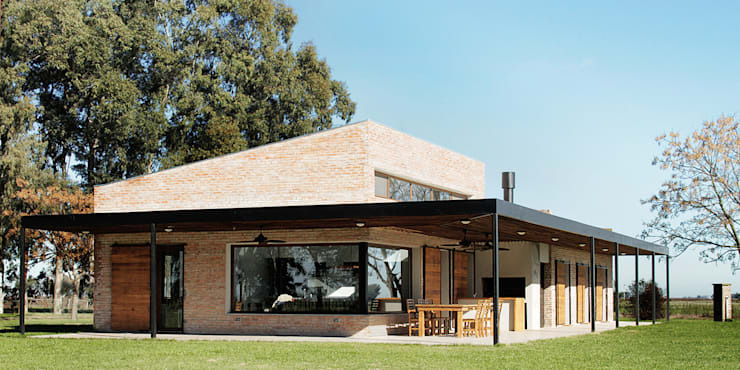 The home may have a contemporary structure, but its rustic charm lies in the simple materials used to build it. 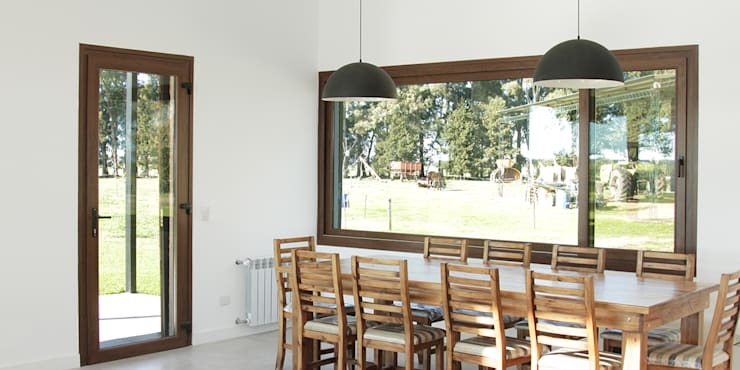 The uniform rows of doors and windows, as well as the brick finish of the home, ensure that there are plenty of interesting nooks created around its various corners. The lighting has been scattered to shine above each and every element in a welcoming manner, too. Impressed by this rustic home? Here's another intriguing abode you're bound to love: The studio apartment with space for everything.